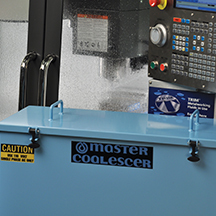 Oil/Water Separators were developed by Master Fluid Solutions to extend coolant life and to reduce the harmful effects of tramp oil contamination on water-miscible fluids such as poor tool life and finishes, corrosion, dermatitis, and fluid rancidity. Tramp oil is a major source of problems associated with water miscible cutting and grinding fluids. Numerous devices ("floating ropes," wheels, and belts) have been developed over the years to remove "free floating" tramp oil from the surface of coolant. While they have all worked to one degree or another, they generally have been either "troublesome," high maintenance, relatively ineffective, or able to operate only on limited liquid level fluctuations. As a "belt-type" skimmer, these units are effective in removing floating oil from widely fluctuating liquid levels of coolants or parts washing solutions. The SCROUNGER® features a revolutionary new oleophilic belt and a totally new concept of stripping the separated oil from the belt. 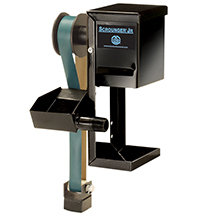 The SCROUNGER® Jr uses the same "oil loving" belt, but uses a more compact scraper blade to strip the separated oil from the belt. As a "belt-type" skimmer, these units are effective in removing floating oil from widely fluctuating liquid levels of coolants or parts washing solutions. The SCROUNGER® features a revolutionary new oleophilic belt and a totally new concept of stripping the separated oil from the belt. 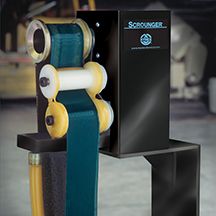 The SCROUNGER® Jr. uses the same "oil loving" belt, but uses a more compact scraper blade to strip the separated oil from the belt. 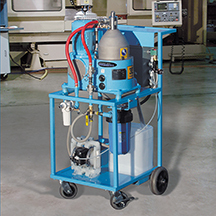 Developed to meet the needs of the small metalworking plant for a compact, portable, high-speed centrifuge, tramp oil separator, the Tramp Oil Terminator™ will process both water-miscible coolants and aqueous cleaners to remove free and emulsified tramp oils, providing clean and reusable coolants and cleaners. Removing tramp oils (hydraulic oils, way lubes or any undesirable oil) from coolants and cleaners removes a food source for bacteria, reduces undesirable residues, and reduces smoke and oil mist in the shop atmosphere.